This is possibly an important guide to get started and protect not to get ripped off with marketing of Wearable & IoT projects. Here is a cost effective list of needed things for Arduino wearable & IoT projects which practical for LilyPad, Gemma, Flora, Yun Mini etc. Of course one need the full setup of DIY electronics for normal development boards starting from breadboard, multimeter to topics which are under our electronics tag. There are things like wire wrapping, through-hole basic electronics components, SMD components, knowledge to create PCB at home. 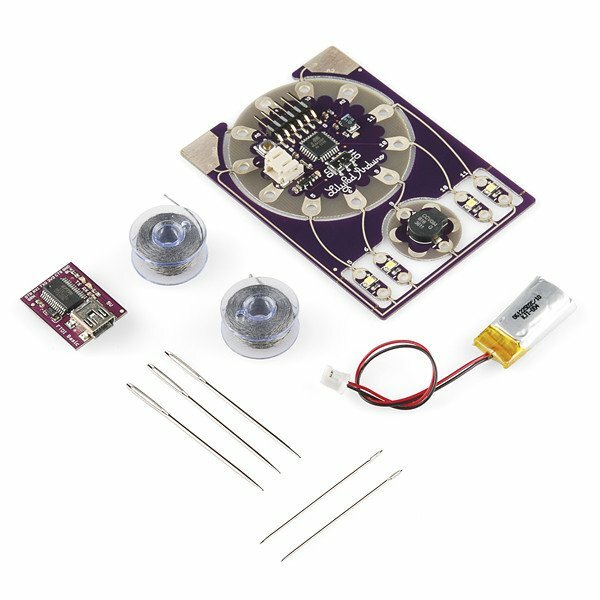 SparkFun ProtoSnap is a LilyPad development kit or E-textile Basics Lab Pack with some usable things. Those kits will give some idea. As Wearable commonly thing like Wrist Watch, we are not going towards insane wearable promoted by some companies. It is practical to test on breadboard and develop as PCB. Ribbon cable is useful in situations where lot of connections needed without messing up wires. 24AWG stranded hook up wire with a flexible silicone jacket is perfect for soldering and connecting any project which needs to be durable. Those companies usually promote conductive thread bobbins. Next part is power supply, there are shield like Coin Cell Battery Holders and 3.7V 1000mAh Lithium ion battery. Of course one can use other power source and Lithium ion battery needs charger. Other important things are conductive stretchable fabric and conductive paint. It is obvious that buying too many miniature shields only for Arduino Wearable & IoT Projects may be costly and not usable with bigger Arduino. It is probably practical to create the circuit on breadboard with basic electronics components, which will be SMD components in this case instead of the list of through-hole basic electronics components we made for normal Arduino. Basically one needs more grasp on creating and designing circuits than being something ready to use marketed as Wearable or IoT. This Article Has Been Shared 4702 Times! Here Is DIY Solar Panel Power Bank Building Instruction & Precautions. You Can Use This For Powering DIY Projects But Not Costly Cell Phone. Cite this article as: Abhishek Ghosh, "List Of Needed Things For Arduino Wearable & IoT Projects," in The Customize Windows, June 7, 2017, April 21, 2019, https://thecustomizewindows.com/2017/06/list-of-needed-things-for-arduino-wearable-iot-projects/.